National Cheeseburger Day is fast approaching, and it is one holiday your office will be glad to celebrate. After all, who doesn’t love sinking their teeth into a half-pound patty of ground chuck on a pillowy potato bun? There’s a joyous shift in cheeseburger trends and burger catering. Forget the basic burger dressed with lettuce and mayo. Creativity beckons. Below, we ditch the humble hamburger and highlight some of the most unique burgers you’ll want to get your hands on. Don’t let National Cheeseburger Day pass you by without trying one of these ambitious cheeseburger updates. Offices looking for a way to boost morale should take a page from Argentina’s weekend playbook. The Argentinian “asado” is not just barbecue; it’s a staple of social events, used to connect family and friends. 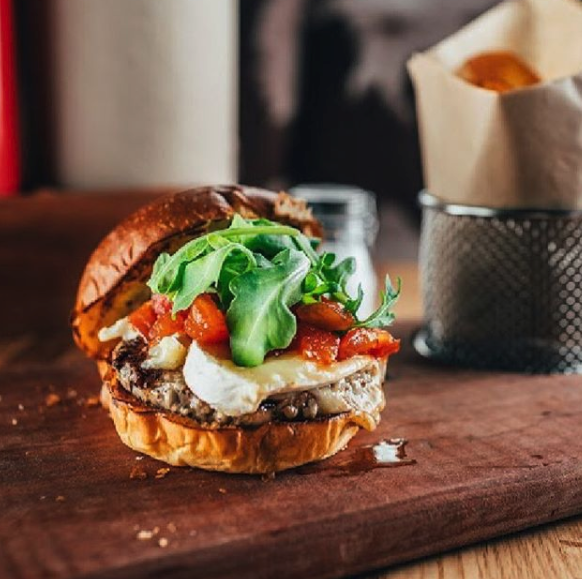 Asado burgers are cooked over an open fire grill and slathered with provoleta, a thick cut slab of gooey provolone cheese drizzled with oil and fragrant herbs. Bookend the burger with toasted slices of dense bread—the only bun capable of standing up to such a juicy, gooey, melty patty. According to Stuffed! San Diego, it’s what’s inside your burger that counts. Patties are, you guessed it, stuffed with a drippy slurry of pepper jack, American, or blue cheese. This is seared crusty brown to trap the goodness inside. Anyone who dares can top it off with mac and cheese or pickled jalapeños. Just make sure to ask for extra napkins upon delivery. Unusual toppings are good reasons to dress a plain beef patty on National Cheeseburger Day. Trust us, you’ll be a believer. Homemade pimento cheese and fried pickles fight for bun space at Bang Bang Burgers in Charlotte, North Carolina. Pulled pork and coleslaw join the party at chef Michael Symon’s joint the B Spot. Catering to a sweet tooth? “The King” burger à la Boston Burger Company channels Elvis Presley and finds a way to fuse peanut butter, bacon, fried bananas, and cinnamon sugar into one explosive bite. Innovation alert! Boston’s Beta Burger uses technology to up the burger catering ante. Their burgers send your taste buds on an adventure. A cooking process called sous vide, or sealing food “under vacuum” in an airtight bag, keeps every ounce of meat unbelievably moist. The result? A juicy lunchtime tropical paradise masquerading as the LoLa burger. Grilled pineapples and onions, smoked bacon, and teriyaki aioli work in perfect harmony to bring Hawaii to your office. A carnivore, a famished worker, and a dieter walk into the break room hunting for chow. Enter the tuna burger. This “non-burger” at Bad Daddy’s Burger Bar consists of house ground poke-style tuna—seared to perfection so it doesn’t sacrifice on texture or flavor—and pungent toppings sure to awaken all senses. An arugula and crisp wasabi slaw, Thai chili sauce, and a toasted sesame bun are the perfect accouterments to this unique patty. Burger catering, indeed. 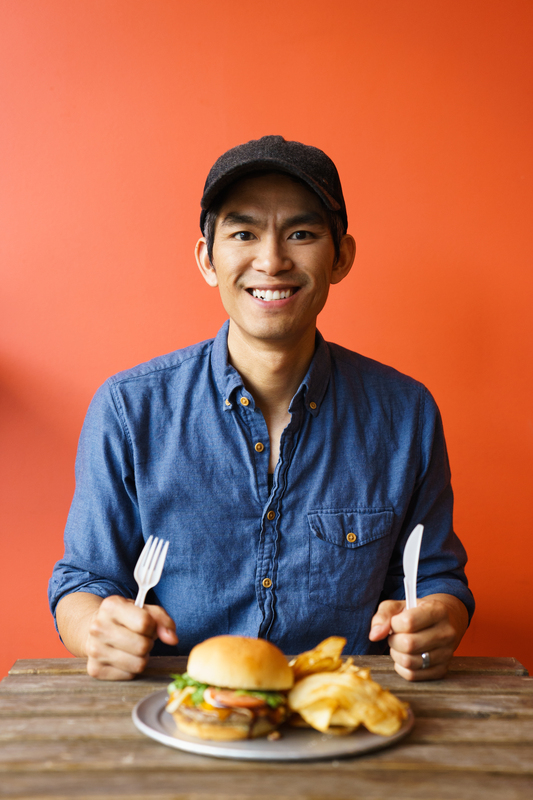 The bold Vietnamese flavors typical of a banh mi sandwich are bombarding America’s burger scene and taking root in a beautiful way. 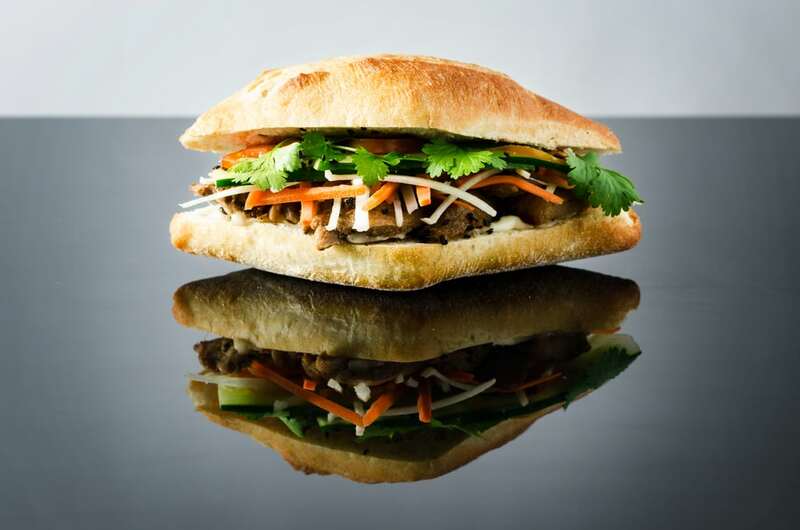 The iconic Vietnamese sandwich is a fusion of seasoned meats and crisp vegetables—a welcome update to the classic beef and cheeseburger combo. Burger catering goes global just in time for the lunch rush when ground chuck gets spiced with cumin, Tabasco-spiked mayonnaise, slivers of crunchy pickled carrots, and sprigs of cilantro. Who says burgers must be beef? 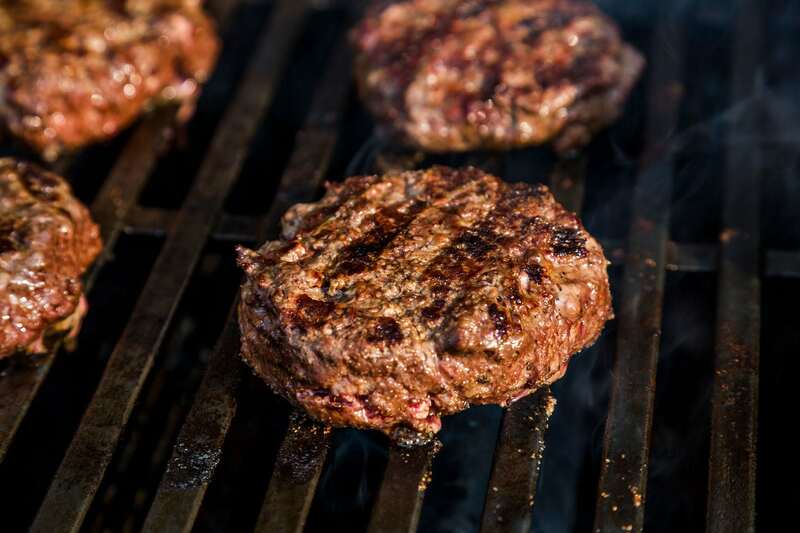 A recent Restaurant Business report highlights the invasion of beef-less burgers on the scene. No, we’re not talkin’ vegetarian-inspired burgers. We’re talking patties built with everything but ground beef. Offices offended by conformity should consider celebrating National Cheeseburger Day with ethnic flair. Opt for a Mexican chorizo burger topped with pico de gallo, queso fresco, fried jalapeños, and avocado crema. 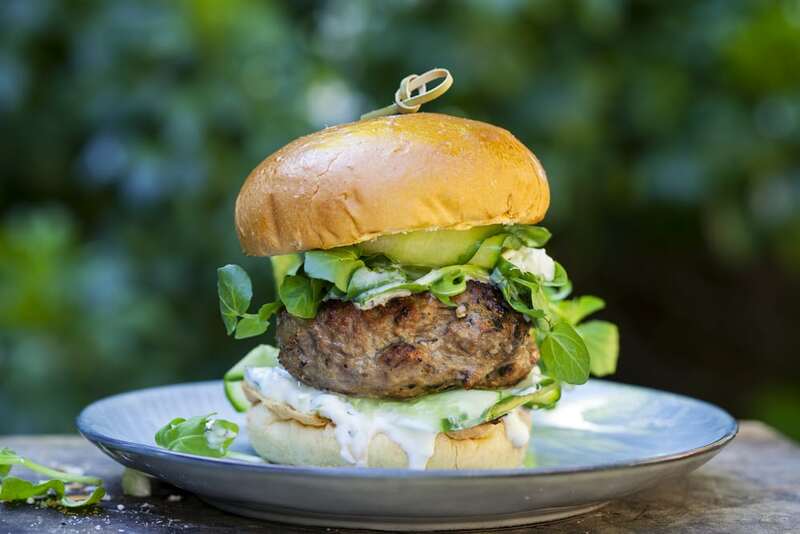 Or go Mediterranean with a spiced lamb burger with tzatziki, red onion, and crisp arugula on a brioche bun. 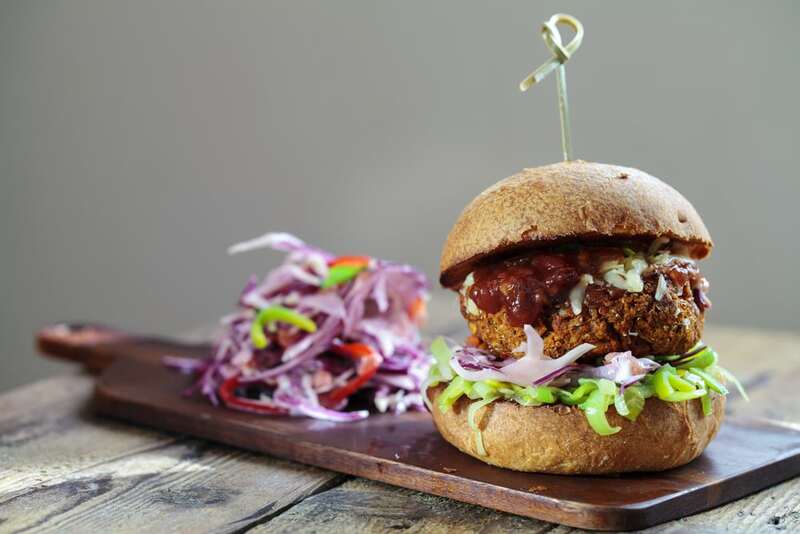 Okay, so this burger update has no meat, but it’s hip to be veg, so we’re making an exception. Burger Lounge is hardly the first restaurant to introduce the plant kingdom to burgers, but their quinoa burger is so good, we had to put it on your radar just in time for National Cheeseburger Day. Then there’s a herbivore-inspired patty concocted by the geniuses at Bon Appétit. With sweet potato as a binder, quinoa for protein, and mushrooms for depth, this veggie burger surpasses all expectations.